What do you need in your kit when you are a Makeup FX Artist? To a large extent it depends on the kind of work you usually do. Is it factual recreation or fantasy creations? Do you have time to build FX in your workspace beforehand, or are you regularly called upon to put together an Out-of-kit Effect at the last minute? Of course, you won’t necessarily need your entire kit on every job, but you will want a comprehensive set of tools and products to get you through any situation you are likely to face in your working life. Either way, shopping for Product and Equipment can be a minefield of torturous decision making and insecurity… And making the wrong purchase can be worse than not buying anything! When faced with a multitude of alternative brands and glossy marketing material making grandiose promises, it is always difficult to know where to start. 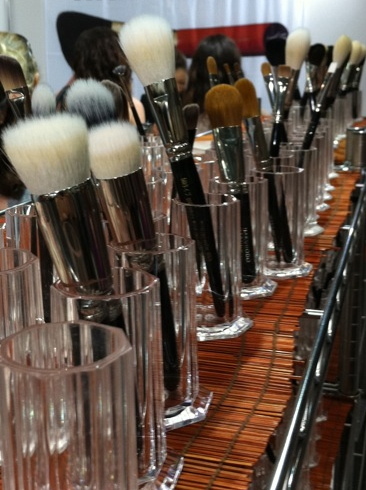 A case in point is Makeup Brushes: how many do you own? Twenty? Forty? Now, being honest with yourself: how many do you actually USE??? I’d wager that you rely on the same half dozen for everything you do!! With this in mind, I advise you to read the following list carefully and pick out only items that seem to you to be immediately necessary, or perhaps things that you have seen in other peoples kits and think would be useful to you in your current line of work. Accumulating a comprehensive and versatile kit is a major investment in your career, so try to only buy things you know you will use or are willing to learn to use!! And always buy the best quality you can afford, that is justified by the work you do. Do I already have a similar product I use all the time, love it to death and want to try a new variation or colour? 2. Will I actually use it? Do I already have six in other brands or colours that I KNOW I don’t use? Will it require me to learn a new technique that I haven’t gotten around to doing yet? 3. Can I afford to buy it? Do I have the money right now? Does the amount of use I will get out of it justify the asking price or is there a cheaper alternative that will do the same job? 4. Will it cost me NOT to buy it? Is this a current industry standard product that replaces an old fashioned or outdated material or technique? Will I be able to produce my best work without it or will I just be ‘making do’? If you can answer YES to ALL four questions, then buy it!! If you answered YES just to the first two, make a Wishlist and save up! Ok, so heres MY list! Bear in mind that this is not a beginners kit, but it will give you something to use as a comprehensive reference checklist, based on my own personal kit. Your needs may be different based on the type of work you do and the conditions under which you regularly do that work. Start with what you think you can use, or what you are most likely to need immediately, and build your stock up gradually. It ain’t cheap, but everything on here is worth its place! If you are starting out you will be responsible for pretty much everything you need.. in fact I even have a pop-up canopy (KD) in my stock, because when I started I often needed it! On bigger projects the Production Company will organise some things for you, (most notably shelter, power, water, and minor things like that!!) but you still need to be organised enough to be able to pull a rabbit out of a hat! Every now and again I reread this list, and realise I left something off the original, so it will be updated from time to time!! Please, if anyone else has things they cant live without please feel free to let me know and I will add them! *The list is in more or less alphabetical order for categories and items, so if you are looking for something in particular, scroll through until you find the right category. Apron- get one of the chemical resistant ones from a Hairdressers supplier. Boots, waterproof, silent soles, ankle support. Gloves- weatherproof (ski gloves), also fingerless mittens to work in. *My faves are from New Zealand, made from merino wool spun with possum hair, stay warm when totally sodden! On that note- they also make the best socks in the known univers out of the same stuff- merino ultrafine wool spun with possum hair (which is a feral animal in NZ) it is the warmest combo ever even when wet. There is NOTHING worse than cold, numb, wet, feet. NOTHING! Goretex rainwear, no substitutes! *You need to be able to stand under the shower and not get wet. Or sit in a puddle in it…. Hat– rain and sun protection. Silk or wool thermal underwear, -silk does not burn, neither does wool, and unlike polypropylene wool will stay warm even if you are drenched, which is why the Vikings used it! You need layers to be able to adjust no matter the working temperature… I like Icebreaker Merino wear from New Zealand – the tag line used to be “no stink” and its true!!! Keeps you hot when its freezing, and cool when its baking out.. wonderful stuff. Spare lenses, case and saline. Also bring your glasses in case its dusty or there’s grit flying about. Vest & jacket- get a good duck or goosedown vest, they are fabulous and will squash under your rainwear too. Poly fleece jackets are good for warmth. Vest with pockets is also useful for on-set maintenance. WATERPROOF Bag for storing Wet Weather gear and extra layers. Leave it in the boot of your car. WATERPROOF Bag or Pack Cover to slip over your Onset bag to keep it totally weatherproof. First Aid Kit for yourself. Hand cream and/or barrier cream. When you are constantly washing your hands it dries out your skin something terrible. Also if it is cold and or wet. Umbrellas – Large, opaque *If you are doing low budget things, you will want umbrellas for the actors during rainy scenes and also for sun protection in summer, or for fair skinned actors- nothing worse than an actor having your hard work wash off in the drizzle or turn red underneath from sunburn! *On large budget or professional productions the Costume Dept will usually take care of things like that, and Unit will also have Umbrellas for rainy days. Discuss this with your other Depts before shooting if you are unsure. Tears, Tearstick and/or Tearblower (*peppermint oil or Vicks inhaler dabbed under the eyes works on lots of people too..
‘Skin Illustrator’ Glazing Gel colours – a water based translucent gel that makes fantastic colouring out-of-kit effects and safe round eyes. ‘Skin Illustrator’ Glazing Sprays – colours that match the Galzing Gels in a liquid form, fantastic for large area and they make THE best ‘Sunburn’ effect in the entire universe!!!! Tattoo cover- for obvious reasons. You can use inks and cream over, or RMG products. Tattoos, water or alcohol activated, and Tattoo inks or alcohol based marker pens. Tooth colours- traditional toothstains can discolour veneers. If your actor has them then use PPI Fleet Street Pegworks Tooth Lacquers which are safe on these. “Mud” and “Grime” – mix a good onset sunscreen (one that doesnt ‘flash’ or flare under lights- or make your actors look like ghosts) with enough cosmetic dirt powder or cosmetic pigment to make a good dirt mix. Also comes in handy for an instant tan, and has the benefit of being a sunscreen as well! Extension leads, various length– if you are working small projects its easier to have your own than trying to get someone to find you one! Buy good quality and at least one outdoor safe lead. Piggyback plugs are good on short leads too. Gaffer Tape –because you always need gaffer tape!! 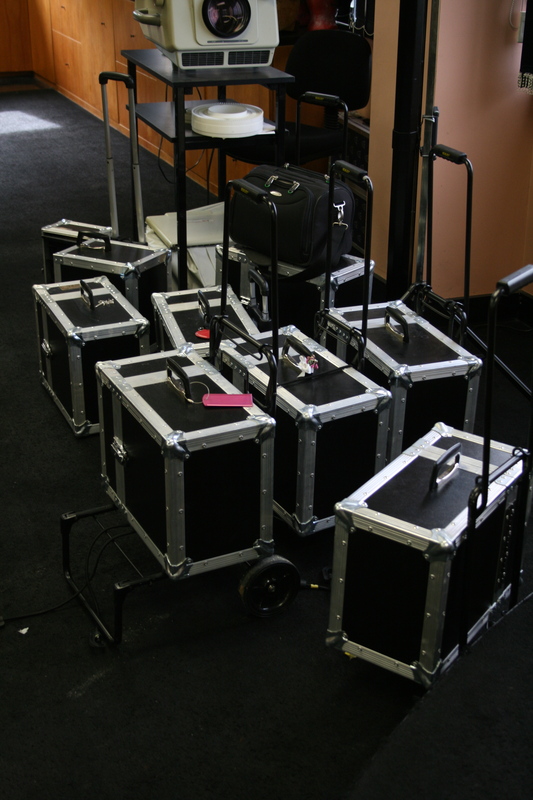 Kit Bags- Easy to Transport: use custom made makeup bags and trolleys, or toolboxes, or even wheeled suitcases. * Soon to be a separate post just on this subject! Digital Camera -for continuity photos. Terrific if you get one with a stylus that allows you to write the Scene # and Shoot Day directly onto the photo. A digital is better than a digital SLR, not for quality but because you can take photos SILENTLY, which means that if you need to you can take shots DURING scenes. Just cover up any lights and turn flash OFF!!! iPad, or Tablet, or Digital Photo Storer, – I personally love the iPad or tablet. YOu can keep all of your photos on it for easy viewing and instant reference, transfer them directly from the camera, you can also put your script and other information like breakdowns on it, so they’re easily at hand and editable. Also if you get your email on it you will have all of your department correspondence, callsheets and the like in an easy to search format, as well as back on your main computer or laptop, whenever you need them. Pens. And spare pens. For writing notes on callsheets, filling out timesheets, making continuity notes… Erasable ones ar handy too. Script Folder or Binder –preferably a ring binder, and then its simple to add script updates easily. Industry standard can vary between countries, (US uses three holes). Drivers Licence- you will be working long hours and late nights/early mornings, in remote locations. You need your Drivers Licence! A reliable Car (motorbikes and scooters are easy to park but you cant fit your kit in one…) Also crucial- YOU MUST be able to fit your kit in it!!!!!!!! Mobile Phone. If you do alot of work in out of the way areas make sure your phone plan is with a provider who has good coverage!!! Phone Credit– if you are on a Prepaid plan! Production Managers and ADs need to be able to contact you and you need to be able to reply! Etag – if you are in a state that has toll roads. Thanks Debbie Muller for offering this last tip: To get anywhere in this business you are going to need the support of family and friends. Especially if you have a ‘significant other’, there are going to be a great many demands and strains placed upon your relationships. While you are working, you will have to forget about having a social life- your world will consist of work, and sleep, with a minor bit of housekeeping and clothes washing in between! This industry chews people up and spits them out. Relationships are often the first casualty. If you are serious about this as a career, make sure they can handle it. Discuss things BEFORE they turn into major problems! This entry was posted on Thursday, August 16th, 2012 at 10:16 pm	and tagged with Cosmetics, film makeup, learn makeup, learn sfx makeup, make-up artist, Make-up FX, makeup and hair, makeup artist, special fx and posted in KIT & CABOODLE, Makeup FX. You can follow any responses to this entry through the RSS 2.0 feed.